This chapter principally analyses meat in terms of its relations to ideology. Certainly, a right-wing vegetarianism existed, and is traceable in the Italian Regency of Fiume, Fascism and Nazism, three dictatorships that ruled in today’s Croatia, Italy and Germany respectively, and threatening the entire Europe. These dictatorships were also built on what I term ‘sacred vegetarianism’, a propagandistic meat abstention descending from old Oriental myths. Nonetheless, it must be said that Fascism and Nazism were adverse to the vegetarian associations in their countries, demonstrating that sacred vegetarianism was exclusively a matter of propaganda. Starting from studies that I have already published, the first part of this chapter summarizes what I have already found and interprets the result in cultural terms. What these dictatorships communicated, in fact, became part of the collective imaginary of these nations, and thus may be considered as part of cultural history. 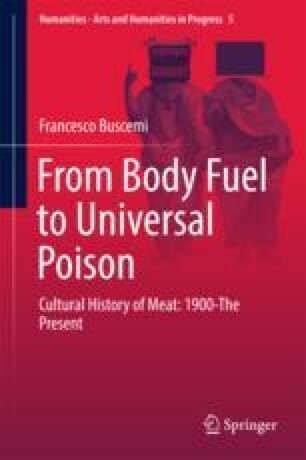 The second part of the chapter is, conversely, devoted to the way in which meat was ideologically represented in the US, and to scientific discoveries that encouraged meat consumption. Another issue analyzed is meat in WWII, from the points of view of both the soldiers at the front and the rest of the people at home. The short story is a tale about ideology and about how it splits communities into fighting factions. Nobel Prize. 2017. The nobel prize in physiology or medicine 1934. www.NobelPrize.org. Accessed 17 May 2017.